The school at Modern Sailing offers everything you need to achieve your sailing goals. 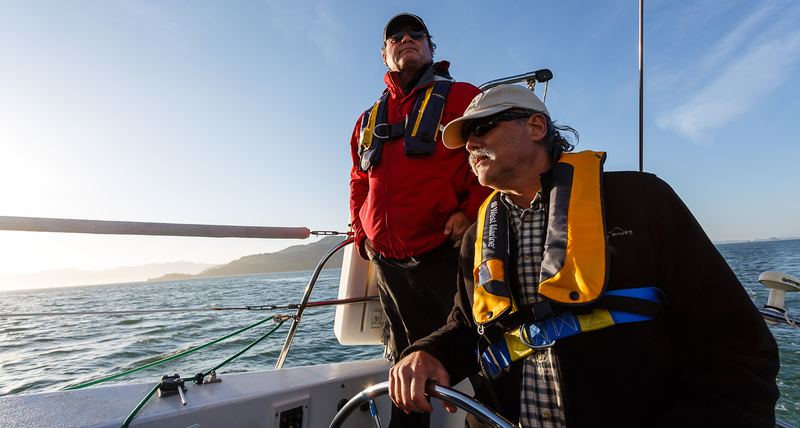 Our American Sailing Association curriculum is internationally-recognized, teaching adult students the range of skills from basic crew participation to achieving the confidence to sail the coast, cross oceans, or charter a boat internationally. In addition to the ASA Core Curriculum, we offer a suite of skill-building clinics to assist students in further refining their skills. Explore the beautiful California Coast and experience ocean sailing with our Advanced Coastal Cruising course, or learn to be a racer with our Recreational Race Clinic. Modern Sailing provides the resources you'll need to make your sailing dreams come true. Modern Sailing School & Club is an American Sailing Association school. We teach to their internationally-recognized standards. Our expert instructors have received accolades for teaching novice students in ASA 101, Basic Keelboat Sailing, as well as advanced students at the ASA 106, Advanced Coastal Cruising level. Whether you are exploring the sport of sailing for the first time, revisiting a forgotten passion, or striving to take your skills to the next level, Modern Sailing can help you reach your goals. Sailing is a performance-oriented activity. The American Sailing Association (ASA) and Modern Sailing are dedicated to recreational boating and safety through education and respected, professional standards. These standards provide you with a means to prove your knowledge and abilities. As a student, you are issued an ASA logbook - your passport to sailing - which documents your achievement of these standards to enable you to charter (rent) almost anywhere in the world. If you own a boat, ASA certifications can help reduce your insurance premiums. View all the ASA Courses we offer. Learn new skills, refresh existing skills, and refine specialized skills. In addition to full-length courses, we offer a selection of clinics to help you focus on improving targeted skills. Often only one day, these hands-on opportunities supplement your training and give you flexibility when looking for additional experience. It also helps us customize a lesson plan based on your needs. View all our Clinics. In addition to our Courses and Clinics, you can fast-track your sailing skills and experience by participating in the Modern Sailing Race Program. The Recreational Race Clinic provides the training necessary to feel confident in any crew position. More information about the Recreational Race Program. For over 12 years, we have been training people to become Merchant Marine Licensed Professionals. Through rigorous United States Coast Guard training, you can realize your dreams of becoming a charter captain or sailing instructor. More information about getting your Captain's License. Our staff has extensive training and experience as American Sailing Association Instructor Qualifiers. We offer clinics throughout the year to help sailors earn their Instructor Certifications. Some of our current instructors used to be our students! If you are looking to expand your professional credentials, let us guide you through the process and help you spend more time on the water while sharing your love of sailing. More information about becoming an ASA Sailing Instructor.